Real estate agent Jeffrey White wanted to help low-income families pursue safe, affordable, and well-designed living that wouldn't stretch their budgets. He created the Sarah House with these guidelines in mind. Created from two converted shipping containers, the Sarah House has an open floor plan that creates a warm, cozy atmosphere, along with a full kitchen, bedroom, and bathroom to meet the needs of a couple or small family. The home is customized, built by hand, and full of beautiful and thoughtful details that truly make the house feel like a home. Sarah House is an idea ahead of its time that combines green living with affordability to offer low-income residents a chance to have a home of their own. Once you see this roomy container home, you may want to design your own small living, eco-friendly space! As you enter the home, you'll notice the combination kitchen, living room, and dining area that offers a large space that you can style as you desire. What did creative builders do with leftover pieces of plywood? Make gorgeous, glowing, handmade lamps, of course! Check out these beautiful additions to the living space of the Sarah House. The kitchen counters, custom built and installed, line the side wall of the home and offer plenty of space for meal prep and storage. Upper windows let in streams of sunlight during the day, and the kitchen offers updated appliances, including a stove/range, dishwasher, sink, and full-sized refrigerator. The sun bounces off gorgeous wooden floors and interiors. A sliding glass door leads outside. Down the hall, you'll find the bathroom and bedroom. The bathroom offers a stand-up shower, toilet, and sink and vanity area. A beautiful basin sink combined with a sleek faucet and simple mirror keep the bathroom elegant and minimal, but fully functional. In the bedroom, there are glass doors that lead outside and a huge custom-built closet area. These sliding doors reveal multiple cabinets and compartments that cleverly save space by holding clothes and shoes in baskets, bins, and shelves. A full-sized mirror hides the closet and looks cool at the same time. Here's a better look at the closet's interior. This small home doesn't skimp on closet space! Check out all that room for shoes! One of the true gems of the home is a handmade Tansu chest meant to work as a private door to the bedroom. Look at the amazing attention to detail of this stunning door! It's a work of art, and definitely adds something unique to the space. It's meant to resemble an antique, and it's absolutely gorgeous! Exit the bedroom this way to head outside! This container home has a lot of yard space — perfect for a garden! A carport lets you safely park your vehicle and keep it covered from the weather. 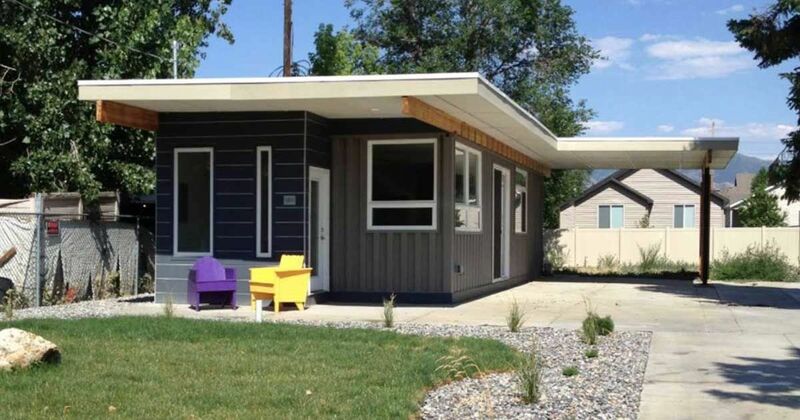 The home uses recycled insulation, eco-friendly plywood, bamboo flooring, and electric-radiant heat to impart a green factor, which will also help reduce overall costs of these necessary shelters.